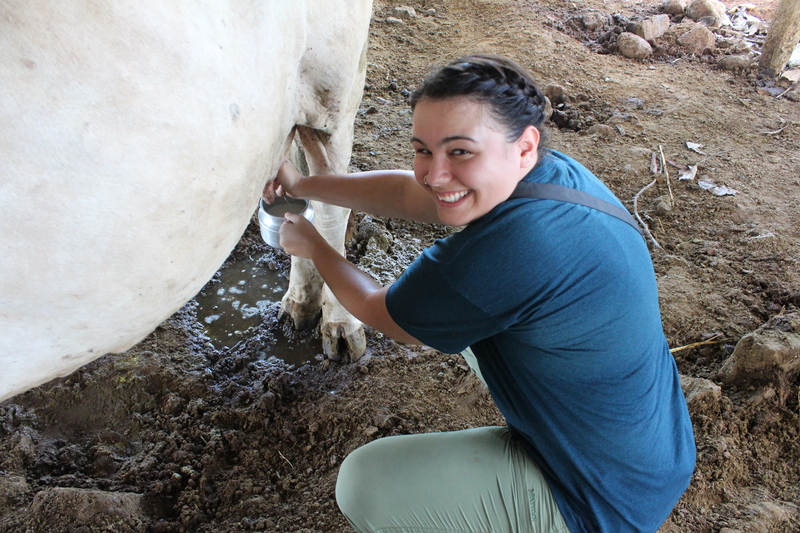 I told myself that this was a cool opportunity that I should at least try, because when else would I have the chance to milk a cow in the heart of Costa Rica? I love cows. And from the moment that our group arrived in Costa Rica I was overwhelmed with countless adorable cow sightings. The people sitting around me were probably quite annoyed because I had to point out every single cow that I saw. So you can imagine that when the option to milk a cow was offered, I jumped on the opportunity. 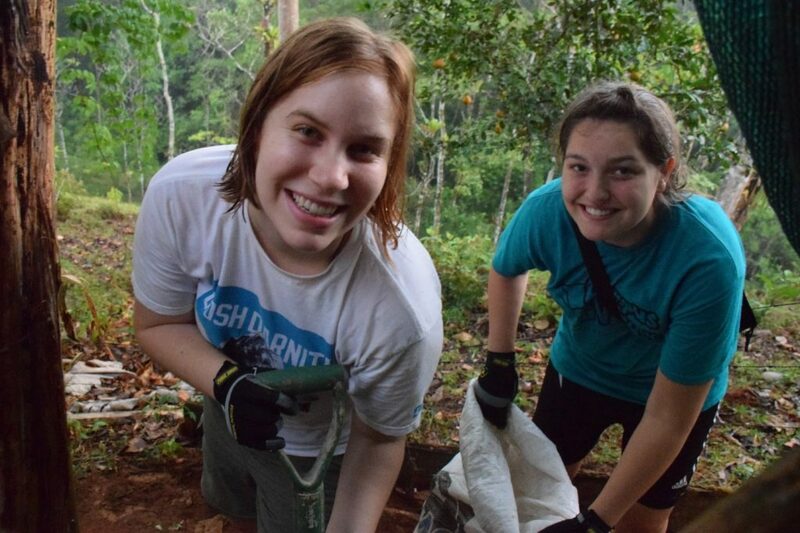 Kathryn and Toni’s first time composting human waste! 1.) Having my passport stamped for traveling to a foreign country. 2.) Getting lost in a foreign country! 3.) Holding a wild snake, cicada, and crab (not simultaneously). 4.) Eating cocoa fruit, guayaba (not guava), water apple, cashew fruit, palm fruit, and an egg fresh off the farm. 5.) Going ziplining (and then going ziplining backwards)! 6.) Seeing a wild capuchin monkey, sloth, toucan, poisonous frog, army ant colony, scorpion, crocodile, bat, lightening bug, turkey, and iguana. 9.) Using a composting toilet. 10.) Staying with a host family. 11.) Learning about and seeing an aquaponics system. 12.) Having a frog jump on my back (and not freaking out about it)! 13.) Painting the outside of a building. 14.) Allowing a huge cockroach to crawl on my arm! 15.) Catching a wild lizard (to let it back out, into the rain forest). 16.) Not having access to a phone, computer, or iPod for over a week. 17.) Not being in contact with my family for more than a week. 18.) Spending a night in the jungle. 19.) Learning how to properly milk a cow (and then actually getting to milk it)! 20.) Sleeping to the sounds of jumping fish (Tilapia). 21.) Purposely walking in the rain without a jacket (and not feeling cold). 22.) Waking up at five in the morning just to see the sunrise. 23.) Dancing at the request of strangers (the children at the primary school we painted). 24.) Dreading the idea of returning home. 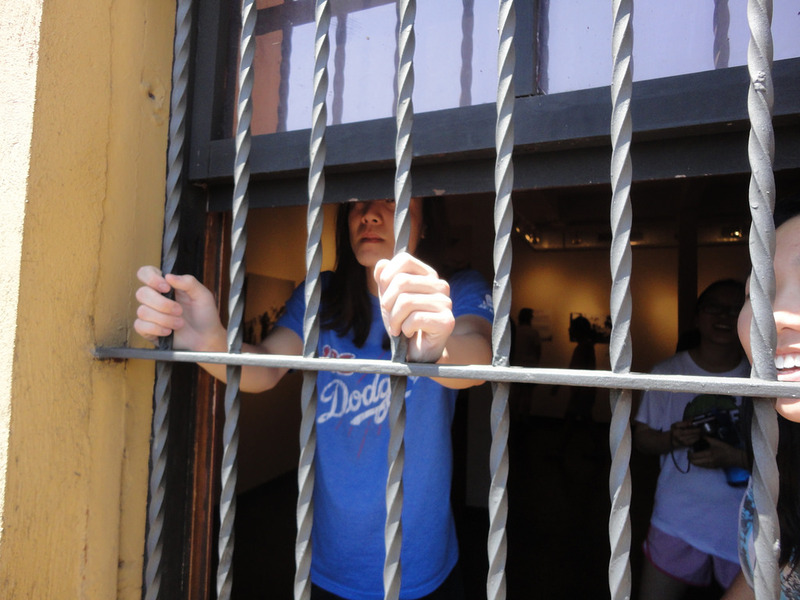 Jeff’s first time behind bars! It was pretty hard to not to add an exclamation point at the end of every event on my list because they were all pretty exciting for me. Each one brought me a new kind of happiness that was somehow different from the last. After talking with more teammates, I discovered that our lists vary drastically in length, specificity, and what one might consider usual. Despite these differences, however, we’ve all had the challenge of facing new, and sometimes frightening, situations. We each learned to embrace the ambiguity of life during (and hopefully after) this trip, and accepted these challenges with hearts full of optimism and determination. 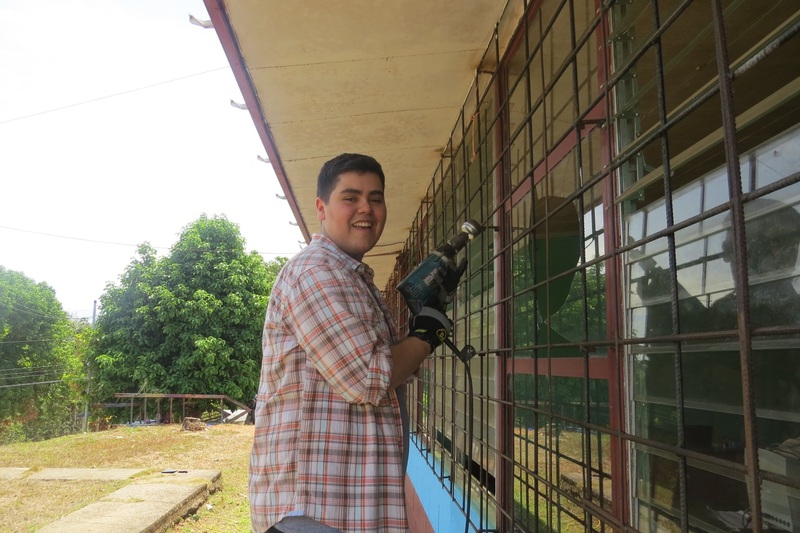 Cesar’s first time using a power drill! Upon returning to the United States, many of us found it difficult to share our experiences with friends and family in a way that captured all of the beauty, adventure, intellectual stimulation, comradeship and inspiration that was present. Although, my words and photographs could never compare to actually living these experiences, I’ve found my list of “firsts” so be a great source of conversation starters. Each “first” provides a little insight into my own perspective on how valuable the trip was. I hope that we all come as close as possible in explaining our complete appreciation of these experiences with others so that, they too, can be inspired to take action in their own communities and learn more about the world around them. 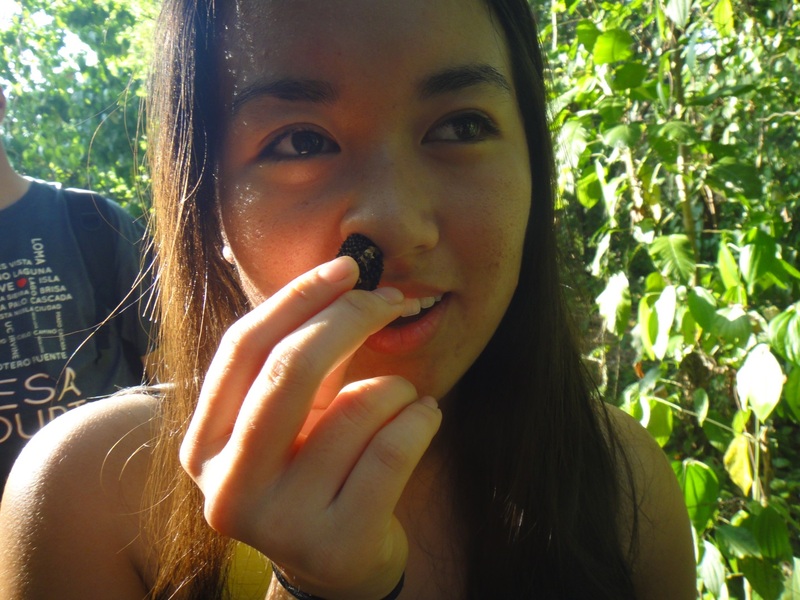 Marissa’s first time smelling this seed! One of the most valuable lessons I’ve learned from this experience is that it’s ultimately up to me whether I make the most of every moment or not. Life is too beautiful to become so busy and wrapped up in the superficial world that you forget what’s truly important— happiness. Sometimes all it takes is a little time in nature or a meaningful, face-to-face conversation with another human being to remind someone how lucky he or she is to be alive. I could waste my spare time playing mindless computer games or searching the web on my phone, or I could use it wisely and go outdoors to help my mom with her garden, learn a new recipe, or spend some quality time playing with Rocky (my dog)—the choice is really up to me. 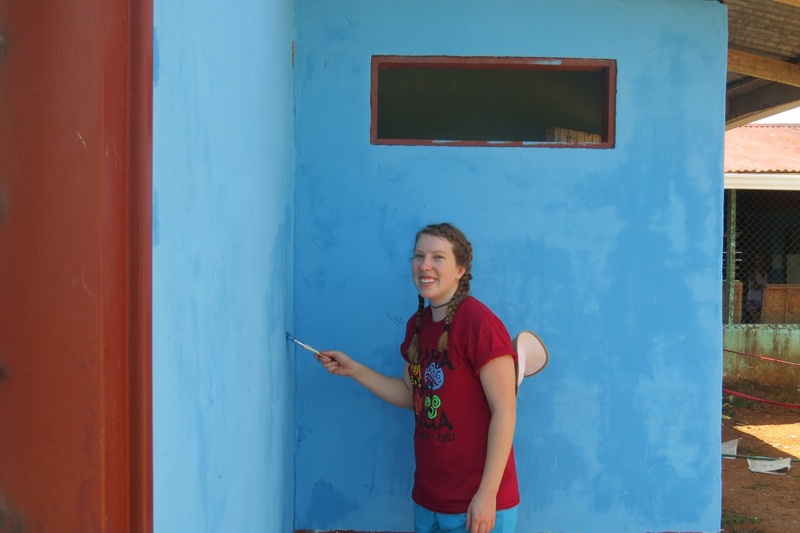 Alyssa’s first time painting a building! I was initially dreading the idea of returning to my home in California, where I was afraid I’d quickly get sucked back into my busy, mundane lifestyle. 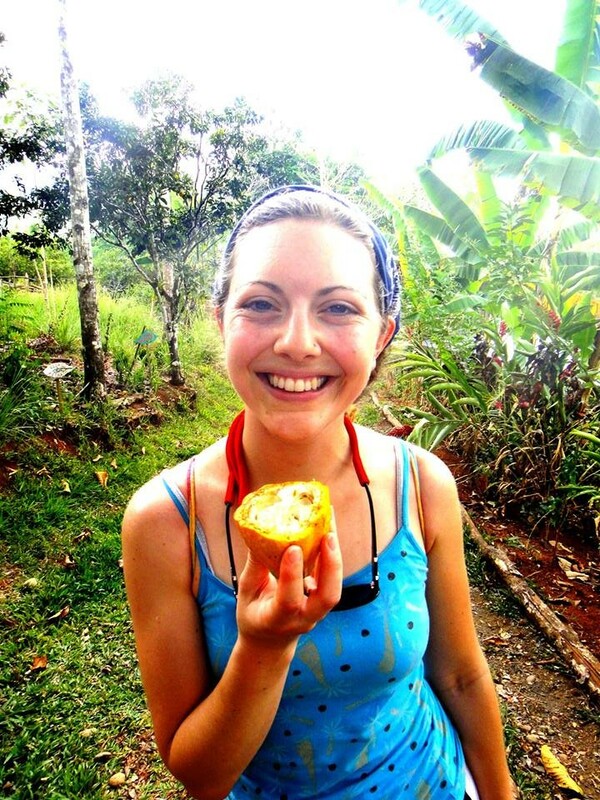 After some thought, though, I realized that each and every one of us has the power to make our lives here in the States just as happy and peaceful as our short, but wonderful lives in Costa Rica. 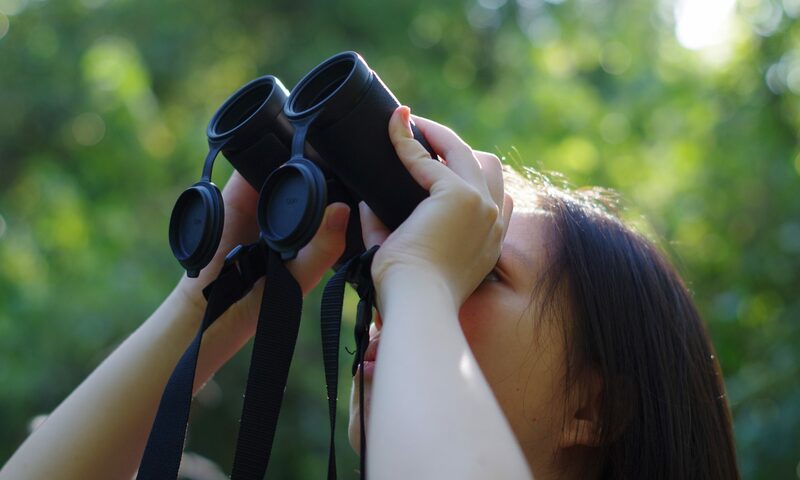 If we truly take the time to stop and appreciate the little treasures in life, we can find a paradise closer than we ever imagined—right here, at home. In an effort to do exactly that, I’ve taken up the challenge of extending my list of firsts with every opportunity I get. I can’t wait to explore my surroundings (that I’ve neglected far too often) and discover what new “firsts” await! Whether it’s as daring as trying to learn how to surf, as challenging as trying to learn a new language, or as simple as starting a friendly conversation with a stranger, adventure awaits! Olivia’s first time eating raw cocoa fruit!